Cabery (population 263) is located in the east-northeastern portion of Illinois. Cabery is unique in that it lies in two counties, Kankakee and Ford. Illinois Route 115 will take you to and from Cabery and crosses paths with County Road E 4100 North in Cabery. The Illinois Central Gulf Railroad lays its tracks through town. The Crane Creek flows by the southeast side of town. A larger town near Cabery is Kankakee which is 15 miles northeast of Cabery. The history of the town of Cabery is in need of research. The high school served the town's children proudly for over four decades. According to research conducted by Sherree Benoit, we know that the Cabery School District ceased offering high school courses in 1946. At that point students who graduated from 8th grade in Cabery would attend high school in nearby Kempton. It was in 1958 that the school districts of Kempton and Cabery officially merged. This act officially recognized Kempton-Cabery High School. The one factor that ultimately doomed Cabery School District was the battle with neighboring Districts for area. Cabery was late in offering a school bus system which also led to the school's low enrollment and ultimate demise. In 1969 Kempton-Cabery High School merged with Cullom to create the Tri-Point School District. In 1972, the Cabery school building was closed for classes for the final time. The school building was converted to apartments for a few years, then left abandoned. It was razed in December of 2002. 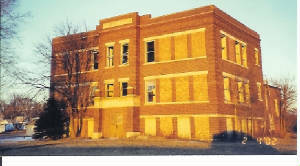 "Cabery's school building made of brick was built in 1913 to accomodate the first eight grades and four years of high school. This was the only four year high school in the area. Consequently, students wanting more than two years of high school came from neighboring towns to complete their schooling. The first class to complete four years and to be graduated in 1915 consisted of Peter Boesen, Charles Miller, and Bruce Riggs. 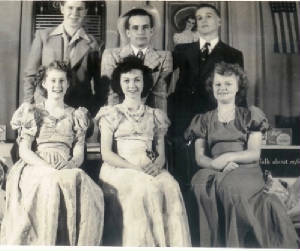 The last class to be graduated from the four year high school in 1946 included Norma Olson and Logan Meadows. 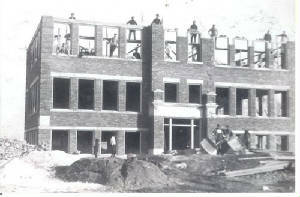 In 1937 a gymnasium was added to the building. 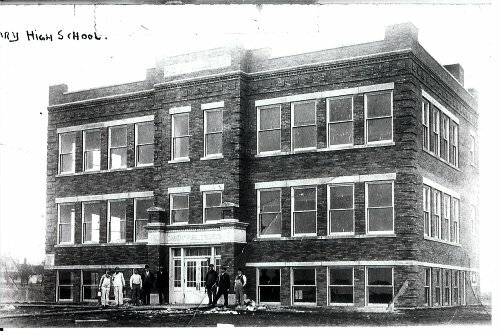 When consolidation began in 1946, the Cabery High School students attended Kempton High School and the first eight grades were at Cabery. There was an attendance of 100 or more. In 1958 Kempton and Cabery united to form the Kempton-Cabery Unit 6 for both grade and high school. In 1969 Kempton, Cabery and Cullom merged to form Tri-Point Unit 6 for both grade and high school. In 1972 the Cabery building was closed and Cabery children were bused to Kempton and Cullom. This required two school buses. Today in 1981 the operation continues in the same way. A shuttle bus comes to Cabery every morning to take the grade school children to Kempton and the high school children to Cullom. There are 42 grade school children and 22 high school children riding the shuttle bus each morning at this time." 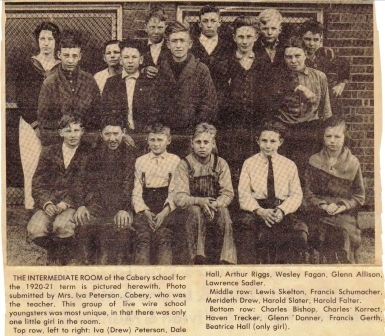 In 1943-44 there were a total of 33 students at Cabery High School. When the school merged with Kempton in 1946 a total of 15 students transfered to Kempton High School to begin the new consolidation effort." 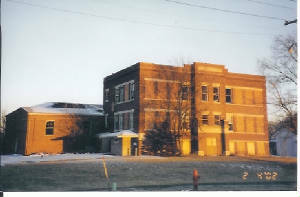 The high school building, pictured on this page, was razed in December of 2002. 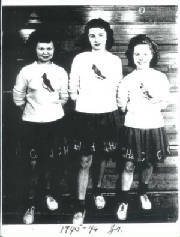 Cabery team nickname: the "Cardinals"
Cabery High School had success on a "State" level in the sports of basketball and track & field. The boys definitely competed in football too. It is possible that baseball was also offered at the school. We are in need of the school's fight song and conference affiliation. 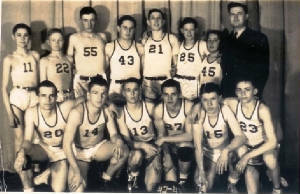 The Cabery High School basketball program won a District title in 1944. 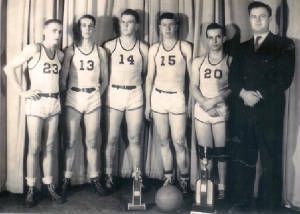 However, the team record and coach's names of these and other great Cabery High School teams are not available. Scores of IHSA tournament games played by Cabery High School as found on the website titled "Illinois Postseason Basketball Scores" are listed below. 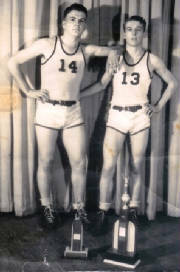 It is remembered by Cabery student and cheerleader for the 1943-44 team Eileen Walsmith that the boys of this year were quite good. In fact, the team ended the season on a 13 game win streak which was halted with a loss in the Regional. The team members were Lawrence Smicker, Durwood Hummel, William Paradise, Jack Colthurst, and Bob Bouk. 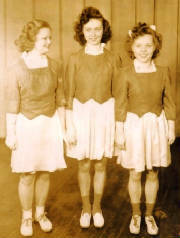 Cheerleaders that year were sisters Pauline and Eileen Walsmith and Yvonne Down. Lawrence Smicker, Durwood Hummel, and William Paradise all joined the Navy for World War II before their senior year (1944-45) leaving only two girls in the graduating senoir class that year. Cullom placed 2nd in District tourney. 1937 and 1938 no scores for Cabery HS were available. Pontiac lost in semi-final round. District scores for Cabery High School from 1940 - 1948 not available. Back Row L to R: Gordon Sadler, ? 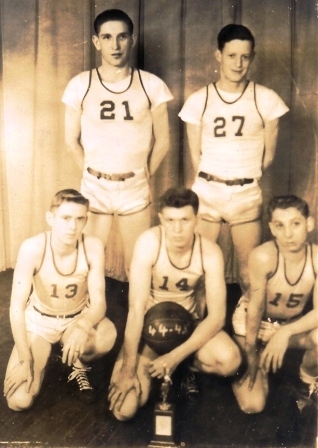 ?, Richard Canham, James Donaghue, Fox Paradise, Bud Hummel, ? ?, Coach ?? One male trackster won a medal at the IHSA 'B' Track Meet. In 1915, C. Miller placed 2nd in the Long Jump. "in 1915 , a student from Cabery High School named C. Miller placed second in the Long Jump. In a story submitted by Mary Swearingen, she states, “The first class to complete four years and to be graduated in 1915 consisted of Peter Boesen, CHARLES MILLER, and Bruce Riggs.” That Charles Miller has to be the young man who placed in the Long Jump in May of 1915 at the State meet. He is on the 1900 Census June 1st for Cabery , Rogers Twp., Ford Co., Illinois, as a 5 year old male, born Dec. 1894, living with his father William M. Miller, a Physician, his mother Alice, sisters Hazel , Genevieve and brother Clayton. The 1910 Census April 18th shows the family in the same location, Charles is listed as Charles E. Miller and 15 years of age. So, in May of 1915 he would have been 20 years 5 months of age, and eligible to compete by being under 21 at that time. Now Charles E. Miller can have his full name entered on IHSA medal winners site." 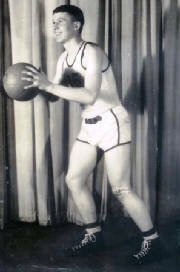 Research conducted by Sherree Benoit confirms that football was once a part of the Cabery High School athletic program. At least in the 1920s it was. 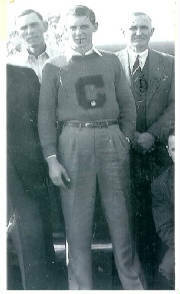 There is mention of a football team in 1925 at Cabery High School that was coached by Charles E. White, who was also a teacher and the school's Principal that year. 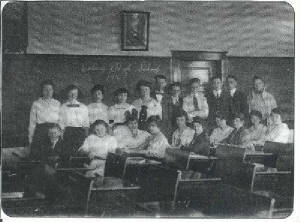 The Cabery High School Students were the benefactors of a well-rounded education. We know that band was an extra-curricular activity offered at the school. 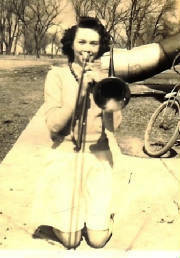 The below photo is of Pauline Walsmith practicing the trombone on the side of the Cabery School building, circa 1943. 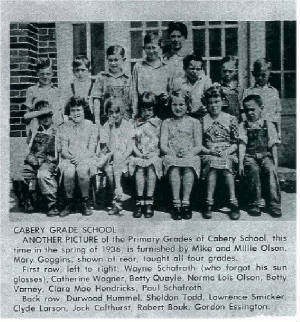 "Cabery became a grade school in 1946 when the country schools were closed. I was in second grade and it was a frightening experience joining classes of 20 or more. My country school was the Downs School and there was one other person in my grade. I think the Downs school had around 12 students and all eight grades were schooled in one room. Cabery may have schooled gradeschoolers prior to the high school closing. That I'm uncertain about. But my years at Cabery Grade School were wonderful. We had hot lunches and great cooks. A master teacher was Amelia Majorowicz. Two grades were housed in one room - The "upper classes" 5,6,7,and 8th were in the second level. Again two classes shared rooms and teachers. One of the best things of being an upperclassman was the fire-esacpe which was hooked to the school and made of metal. Older kids went down first and caught the younger ones coming out of the opening during fire drills. We had great "dodge ball games" during lunch hour. I understand that's not a nice game to play anymore - but gee it was fun. We also played baseball and fox and goose in the winter. We were the Cabery Cardinals. Basketball was big - We had a first and second team and cheerleaders. The Cabery School had a wonderful gym with a well-cared for hardwood floor. There was also a "stage" and music room. A hallway under the school connected the lunch room and the entry to the gym. Trophies of the past were displayed in glass cases. Baseball was played with surrounding schools during afternoons. The school is no longer standing. I believe it was sold as apartments and later abandonded. People helped themselves to that hardwood floor - a few pieces at a time. Amelia Majorowicz was an unmarried school teacher and probably in her 40s when I had her. We thought of her as ancient.....but what a teacher. Other classmates have reflected on how fortunate we were to have her - in spite of her strict control of the classroom. I graduated in 1952 from Cabery - and attended Kempton High School. Kempton later combined to form Tri-Point when attendance was dwindling." "I just got done looking at the old Cabery School....many, many memory's. I started first grade there in 1955. And lived just one block from the school." 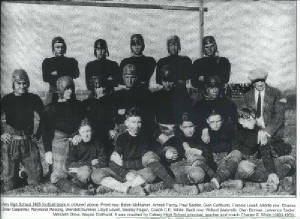 "The town of Cabery had a semi pro football team that was quite famous from 1910 into the 1930's. Their records are unreal. They even played games with Joliet prison inmates. They also had really good baseball teams." 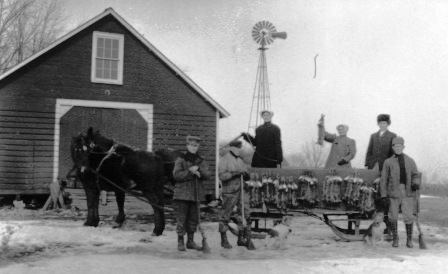 Peter Boesen was born in 1896 and was raised one mile north of Cabery, IL. His class was the first to graduate from Cabery High School. 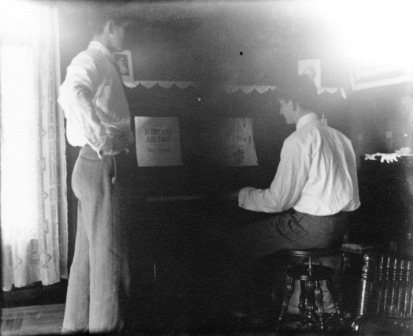 In 1911, Peter got a camera which used glass plate negatives. He took pictures of the family farm and activities. These are some of the pictures he took. One is a double exposure he took of himself at the piano. 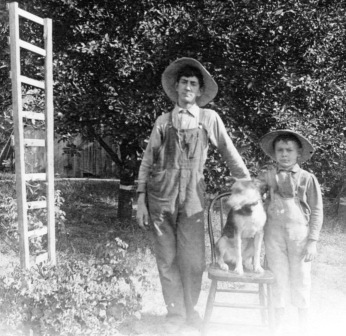 In the second photo, he is dressed in farm wear standing with a younger friend, and third is a photo of him and his family on their farm after hunting rabbits. After graduating from Cabery High School, Peter Boesen attended the University of Illinois at Urbana. He worked summers in re-engineering; one as a surveyor on the Illinois River Road at Peoria, the next at the National Bureau of Standards in Washington D.C. He graduated from the University of Illinois in 1920 at the top of his class in electrical engineering. He was responsible for much of the engineering work for the creation of the Chicago Transit Authority. Bob Bonk,Ben Corn,John Corn,Lawrence Smicker,Jack Colthurst, Coach ? ?